30 Buckets of Pure Bliss! 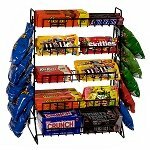 This 30 Bucket Rotating Rack offers massive opportunities for your retail store, convenience one-stop-shop, in your snack bar plus more when it comes to increasing profits and sales figures. Our space-saving rotational display offers efficiency in its design and eliminates dead space. The overall dimensions of this wonderful display is 60-inches high by 22-inches wide. This spinning rack includes five levels with six buckets on each level, providing a convenient way to show off bulk wrapped candy, plush toys, small hardware, and so much more. This freestanding retail rack is great for impulse items and potentially grabbing that one last sale before your patrons walk out that doors. Lids are included for your convenience, plus they help with cleanliness and little hands reaching in when they're not supposed to be. The sturdy wire framing on this bucket rack system will last for years. Why wait? Go ahead and order your floor merchandiser today! 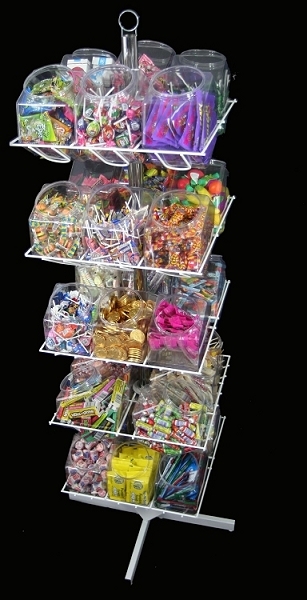 Candy Display Rack With Bins / Scoop Assemblies - 58"
Candy Rack With Towers - Bins - Scoop Assemblies - 72"